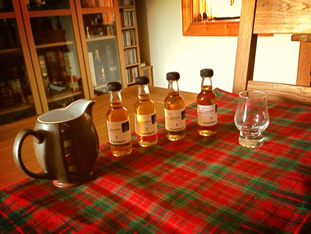 Last Wednesday we had a special tweet tasting which involved not only all grain Whiskies but the tasting wa s blind. The tasting table was all set up the samples at the ready, some water if needed, all the tweet tasters on line and ready to start the tasting. We all had four grain samples, all of us tweeted our nosing and tasting results and many of us got roughly the same styles, but when it came to guessing the distillery, then that was a different thing. Jim was blinkered he only thought of Scotch grain Whisky and that was his downfall, he missed the second tasting which was an Irish Grain. Cameron Brig, Pure Single Grain Scotch Whisky 40% Alc/ vol. Greenore 8 Year Old Irish Single Grain Whiskey 40% Alc/vol. Nikka Coffey Unaged Japanese Single Grain Whisky 45% Alc/vol. Clan Denny Invergordon 1966 – 45 Year Old Single Grain Scotch Whisky, 47.1% Alc/vol. The Cameron Brig started the tasting and it just got better and better. Taste, a little warmth, Thornton special toffee, does not need H2O light liquorice sweet mild ginger, this is really nice. This might even pass as a mid range Bourbon, creamy sweetness. Sherry filled plump raisins, cooked soft fruits topped with vanilla ice cream, spicy rum. 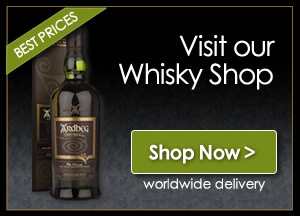 A BIG THANKS goes out to Steve Rush at @TheWhiskyWire , Ken and Fran from Arkwrights @WhiskyandWines.